Yellow school buses are “going green” in school districts across the nation, adapting different fuels and making moves to reduce their carbon footprint while out on daily pickups and drop-offs. In recent years, several green-friendly options have become viable, including biodiesel, compressed natural gas and propane, which all tend to burn cleaner than traditional diesel fuel. These options also lower emissions, create cleaner vehicles and bus stops, and decrease the fumes inhaled by students and school bus drivers alike. 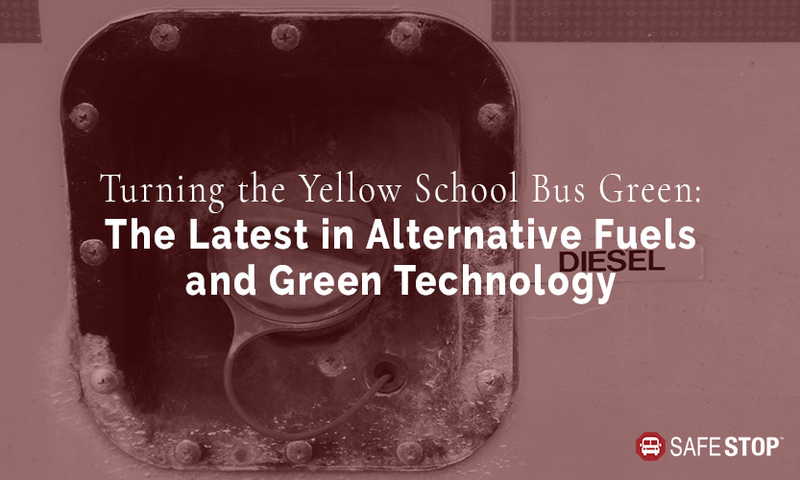 Although the upfront costs of switching yellow school buses to green alternatives may be high, school district administrators have discussed the long-term benefits they’re already seeing to their bottom line. Several fuel options are available. Private companies such as ROUSH CleanTech and Blue Bird Corporation have been working together for years to unveil new alternative-fueled school bus transportation. In recent years, they’ve launched buses that run on propane autogas, which meets both EPA and CARB certification requirements. The buses still get up to 360 horsepower and 450 pounds of torque yet have displayed fuel savings of 30 to 40 percent when compared to diesel. These buses also reduce greenhouse gases by 13-17 percent, hydrocarbon emissions by 80 percent, and nitrogen oxide by 95 percent. New standards have upped the game. The EPA implemented new diesel standards in 2006, and now many school buses are equipped with “clean diesel” technology that eliminates nitrogen oxide and other particulate matter. New national and local regulations are continuing to incentivize districts that look for alternative options. For example, the National School Transportation Association developed a Green School Bus Fleet Certification to recognize school bus operators that create a cleaner environment with green technology, and the EPA endorsed the process in 2017. The lifetime cost of a diesel bus is about $1.4 million, compared to an electric bus at about $1 million, but the cost switchover can be tough for school districts. To help, state grants and electric company partnerships can sometimes give a much-needed boost to districts that have cost barriers. California, for instance, set aside $180 million for hybrid and zero-emission trucks and buses. Massachusetts and New York have begun providing grants for electric school buses, as well. California transportation officials that are piloting grant-funded electric school buses are reporting positive benefits this year. Based on data from the beginning of 2018, one district is expecting a 50 percent savings in fuel costs, and another is lowering costs by about 80 percent. Other green perks are here, too. As school districts begin the transition, electric components are becoming more affordable and available. Battery prices are decreasing each year, and they’re becoming more efficient as the technology develops. Transportation directors are reporting that operation is reliable and quieter, and they anticipate that maintenance costs will go down as regenerative braking stores energy during the braking process for later. School districts across the nation will continue looking at these pilot programs to figure out the best green technology fit for them in coming years.